How do the top performers in any field create their magic? And how can you start generating more creative (and more successful) ideas around your work day after day? …is read those vomit-lists of the 7 (5, 10, 15, 1784, insert-your-lucky-number) things that successful people do every day. Do you really think anyone ever read a list like that, was really and truly taken by the *profound* (cough… cough…) advice to wake up early/plan the day ahead/see failures as lessons/believe in your work (which pretty much encapsulates all such lists), and then *bam! Magic! * became successful? There’s no formula to success. Honestly, you’d have more luck in finding success through new ideas by implementing our opening 5-step process! Even the most creative out-there and original works come from a process. Now, don’t confuse process with routine. Because we aren’t actually saying that if you go to work every day at the same time, sit at the same desk, and do the same things over and over again, you’ll somehow stumble upon an original idea that’s been hiding inside your brain forever. Nop. Doesn’t work that way. And since creativity — and NOT insanity — is what we’re going after here, repetition is not our answer. This is really, really important… Don’t recreate what just worked. Analyze the process you went through to get that result. If you go for the result, it ain’t gonna work. It might, but that’s just luck… We go for the process. Repeat after us: Process is everything. You push your spoon and cereal aside and start “practicing” the pose right away, trying to will your stiff body into an unhumanly bend. Why? Because you’re only trying to replicate a result without understanding the process (the practice, the easier poses, the progressive stretching) that it took to reach that result. Exhibits 1 through 1 million: Nearly every movie sequel ever made. Creativity is the ability to draw distinct ideas together to create something new of value. Creativity and good ideas don’t come out of thin air, but out of other ideas. Out of toying around with ideas. Out of putting together old things in new ways. Or new things in old ways. When I’m (Julia here!) working on the messaging of a new client, I don’t just take out a blank piece of paper and stare at it until a brilliant idea strikes me from above like lightning. That’d never work, and we’d be out of commission by now! Instead, I take that beautiful and terrifying blank piece of paper and write down every cliché, expected, and over-used slogan, phrase, and advertising message I can think of relating to the client’s product and market. Yup, I start out with the bad ones. A means of cleansing and expiation, I guess. open a new path to creativity by selecting possible candidates for synthesis! I’d never, of course, use any ol’ cliché “as is” but the combination of the expected with an unexpected, humorous, or innovative idea coming out of left field might result in something new and delightful! Once I have all my “bad” ideas in place, I start playing with them and listing also the totally-out-there, would-never-say-that phrases to see if some new combination might jump at me from the page. Then I’ll pore over customer testimonials, relevant book reviews, and other messages with clues for customer language and highlight the most powerful sentences and phrases! Some of these often become headlines (with little or even no editing) that combine with the product info for powerful sales results. One of the best advice I (Stella!) ever got from my teachers early on was to look at other people’s work. This advice was repeated to me myriads of times and with increasing frequency as I went through my university training. until I realized that I was supposed to look for inspiration in other people’s work, not for ideas to copy or steal! Everything I produce contributes to a larger discussion that happens in the world around us. I can choose to be unoriginal by repeating what’s already out there. What’s funny, it that I also learned to work with clichés, and learned to do so by top-notch expert advice from one of my professors at SVA. His word to the wise? Real work starts when you have difficulty putting another line on the paper. The first 50 or so renditions always came easily to me. All the clichés your eyes consume on a daily basis without you even knowing, there they were! Popping in my mind and going onto paper! But how many times can you draw a cloud over and over again before you start crying, right? That’s when real creativity kicked in. ‘Cause we had to look at that old familiar shape from new angles and unusual perspectives. And those two steps are still the first steps I take in every single project I take on today. First, I take a look around to see what others are doing in the area, collect some inspiration, find the “empty spaces” where I can offer a new perspective. Then, I start sketching without filters, barriers, or high aspirations until I hit a wall. And I love hitting that wall because it lets me know I’m on the brink of creativity. That’s when my real work starts! You’ve heard of writer’s block before. Actually, all creatives and creatively-minded professionals get the block sometimes. Oh, you know the days. Those days where ideas don’t flow. When creativity goes hiding in a deep cave. When our creative juices sit sulking in a corner refusing to play. If you’re expecting to do your creative work by magic, you’re doomed. The magic shall never come. But if you have a process? 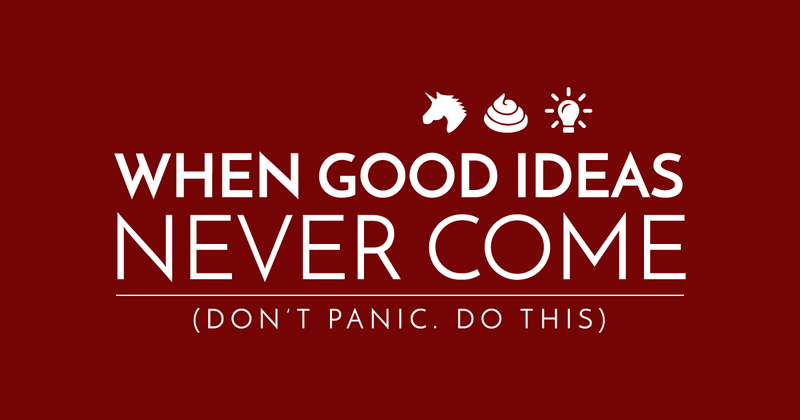 You can start working and wait for good ideas to flow in at their own sweet time. Staring at the blank page, the blank canvas, the blank marketing proposal will never lead anywhere. But when you have a process in place you can go play even in the most cliché of strawberry fields for an entire day without fearing that you’re wasting your time. What do you do on days that you feel stuck to get unstuck? Do you have any weird endearing rituals that you perform to get the creative juices flowing?